Since the weather started to warm up my thoughts have turned to my garden. I have to admit I’m not much for flowers. With the deer that come up on my front yard after dark, there’s no point planting anything in the front yard that the deer like. There are some plants they don’t like: bleeding hearts, daffodils, lavender, and others. I found a list of them on a website. Because of the deer I can’t put my vegetable garden in the front yard, despite it being larger than the back and getting the best sun. Deer are pretty persistent and they can jump over a fence or try to knock it down. Just not worth it. In the back yard I only have to fight the rabbits and the groundhogs. I haven’t seen any groundhogs, but i have seen the rabbits and they leave their piles of rabbit M&Ms all over the yard. Groundhogs would be a bigger problem as they might dig a hole under the fence I’ll put around the garden. Tomato and pepper seedlings coming up. A few weeks ago I planted the first of my seeds. I’ve never done this before but how hard can it be? Actually, harder than it looks, at least for a novice like me. My first plants have come up (see photo above), but haven’t done anything in over a week, so I’m not really sure if they will thrive. The second set (below) is doing better. Zucchini and cucumber coming up. 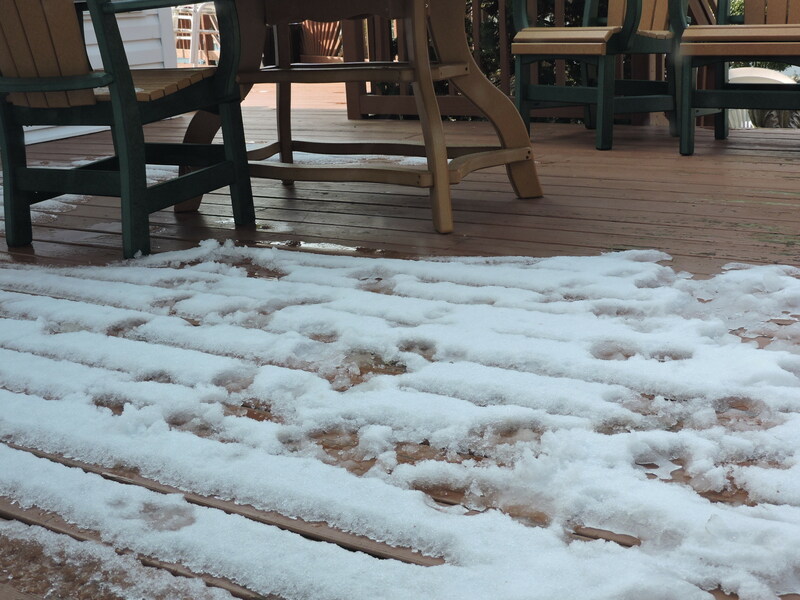 A surprise April snow set back plans to plant outside anytime soon. The snow didn’t last long, but we have had below freezing temperatures most nights since then. I check the temps on weather.com religiously, but we live on a hill, so it’s always 2-4 degrees colder on our street. We only got a few inches during the recent snow, and it melted by the next day. Last weekend I went to the local hardware store in the next town to get some more gardening supplies. I didn’t realize it but they have a garden center. I had a nice chat with the young woman who mans the greenhouse and she gave me some good tips for my seedlings. For one thing, she told me not to water my seedlings but to spritz them with a spray bottle. The soil should be moist, not wet, or you will drown your seedlings. Too late for this advice, as I’ve already killed a few. Note for the future. A few days ago I went back and bought some seedlings. I have them inside for now. I am starting with strawberries, herbs –which I’ll put in pots, and lavender for the front beds. Later I’ll get onions, broccoli and lettuce. Strawberries, lavender, basil and parsley seedlings. A few days ago my berry bushes arrived. They were mostly bare roots, which means they look like a stick. They are packed in a bag with sawdust to help keep the roots moist until you plant them. Yesterday I took them out and moistened the roots and returned them to their sawdust padding. They have to be in a cool, dark place until you plant them. They are back in the garage for now. I am planning to get them in the ground on Friday or Saturday. My landscaper is coming on Friday to show me where the garden will go. He has a master plan for the backyard. Stay tuned for the progress of my garden project. We are expecting another night or two below freezing this week, but by the weekend it should be clear sailing. Remember to post your ‘failures’…there’s lots to learn from them! Thanks for your interest! I agree, I will likely learn as much if not more from failures than from successes. Already I learned that a good quality potting soil is better than the fancy planting system I ordered online, and that sometimes it’s better to just buy seedlings than try to grow them. My biggest challenge will be to keep the critters away from my crop.